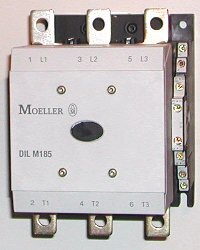 Klockner Moeller - DILM185, DILM225, DILM250, DILM300, DILM400, DILM500, DILM580, DILM650, DILM750, DILM820 and DILM1000 motor starters - contactors. can be inserted before A1. A1 is (+) and A2 is (-). Click here for lug kits, coils, accessories.